ITUATED in Dauphiné, in southern France at the foot of the Alps, just southeast of Gap, is the vale of Laus. Its name means lake in the local dialect as there once was one at the bottom of the basin. In 1666 the hamlet held twenty households scattered in little huts. The inhabitants had built a chapel dedicated to the Annunciation, Notre-Dame de on Recontre [Our Lady of the Good Encounter, meaning Annunciation]. It was here that Our Lady chose to appear in another "Good Encounter", several times to to a humble, unschooled girl, Bl. Benoite Rencurel: "I asked my Son for Laus for the conversion of sinners, and He granted it to me," said the Blessed Virgin to the young shepherdess. Bl. Benoite had learned suffering early in life as she was born into extreme poverty which was made worse when her father died when she was only seven. Our seeress was born in 1647, in September, but two months before the birth of Saint Margaret Mary, future confidante of the Sacred Heart. Creditors were unrelenting to Benoite's widowed mother and so her children had to labor to maintain the family. Benoite was not only a help but a protection for her mother, who had faithfully taught her children the Our Father, Hail Mary, and the Creed. One day she saw some men heading for the house and she ran to warn her mother, fighting off one of them who dared to offer her money in exchange for her virtue. By the time Benoite was twelve the family was in even worse straits, so she took employment tending sheep for two masters at the same time. Thus, it was in the bosom of deprivation, sacrifice and prayer that the future Saint was preparing for her predestined mission. In May of 1664, she was seventeen, praying the Rosary, her favorite devotion, watching her flock, when suddenly an old and venerable man, clothed in the vestments of a bishop of the early Church, came up to her and said: "My daughter, what are you doing here?" "I'm watching my sheep, praying to God, and looking for water to drink." "I'll get some for you," replied the elderly man. And he went to the edge of a well that Benoite had not seen. "You're so beautiful!" she said. "Are you an Angel, or Jesus?" "I am Maurice, to whom the nearby chapel [then it ruins] is dedicated . . . My daughter, do not come back to this place. It is part of a different territory, and the guards would take your flock if they found it here. Go to the valley above Saint-Étienne. That is where you will see the Mother of God." "But Sir, She is in Heaven. How can I see Her there?" "Yes, She is in Heaven, and on earth too when She wants." "Lovely Lady, what are You doing here? Did You come to buy some plaster?" Then, without waiting for an answer, she added: "Would You be so kind as to give us this child? He would delight us all!" "Would You like to eat with me? I've got some good bread; we can dip it in the spring." The Lady smiled again and continued letting her enjoy Her presence, going in and coming out of the cavity in the rock, approaching Benoite and moving away from her. Then, when evening came She took the Child in Her arms, entered the grotto and disappeared. The following day and for the next four months, Benoite contemplated on that site the Joy of the Angels and the Ornament of Heaven. The shepherd girl's face was transfigured right from the start; she shared her happiness with everyone in cheerful simplicity. Seeing the change in her, people began to wonder, "What if it should be the Blessed Virgin she is seeing?" Benoite did not know this herself, and she never dared to ask the Lady, who gave her all this joy, who She was. Before making Benoite Her friend and the dispenser of Her graces, the Blessed Virgin strongly attached the shepherd girl's soul to Herself with irresistible attraction. Then, after two months of silence, She made her Her pupil and began to speak in order to teach, test and encourage her. Putting Herself on the level of the mountain girl's uneducated mind, the Queen of Heaven condescended to familiarities that would surprise us if we did not know that Mary's goodness is boundless. One day our tender Mother invited Benoite to rest by Her side, and the weary child went peacefully to sleep on the hem of the Virgin's mantle. Another time, doing as mothers do to teach prayers to their children, She had her repeat, word by word, the Litany of Loreto, then enjoined her to teach it to the girls of Saint-Étienne and go to church with them every evening to sing it there. With the sweetness and patience of a mother, She formed her gradually in view of her future mission. The pious young girl was still uncouth, quite stubborn and readily impatient. Before the Virgin Mary personally revealed Her name, She initiated Benoite in the role she was to play all her life: to work at the conversion of sinners through prayer, sacrifice, and-----a special vocation-----exhortation, for God had granted her the charism of reading in hearts. Consequently, she was often given the heavy task of correcting souls and disclosing their sad condition to them. When needed, she would remind them of their forgotten or hidden sins and urge them to purify themselves of them. A striking conversion, among many others, occurred to give credit not only to the Apparition, but to the seeress' clairvoyance as well. Benoite's employer, Mrs. Rolland, a woman who had no interest whatsoever in religion, wanted to see for herself what was going on at the site of the apparitions. One day before dawn she went in secret to the grotto, entered before Benoite, and hid behind a rock. Benoite arrived, and a few moments later she saw the Beautiful Lady. "Your mistress is over there, hiding behind the rock," said Mary. "Tell her not to curse with the name of Jesus, because if she keeps it up there will be no paradise for her: Her conscience is in a very bad state; she should do penance." The employer, who had heard everything, tearfully promised to amend. And she kept her word. News of the apparitions began to spread; people were talking about them all over. Many believed in them, but several others were incredulous and treated the shepherd girl as a false mystic. Among the many people who supported Benoite were the little girls of St. Stephen's who, like her, loved Mary with all their heart. To repeat what we summarized above, the Blessed Virgin said to her, "Tell the girls of St. Stephen's to sing the Litany of the Blessed Virgin in the church every evening, with the permission of the Prior, and you will see that they will do it." Indeed, once they had learned their "lesson," the Litany was chanted every evening with great devotion. It might be interesting to point out here that Laus is in the diocese of Embrun. Since 1638, the year of the consecration of France to Mary by King Louis XIII, the Litany of Loreto had been chanted regularly in the cathedral of Embrun. As reports of the apparitions took on greater expansion, François Grimaud, the magistrate of Avançon Valley, a good Catholic and a man of integrity, decided to conduct an investigation. After serious examination he concluded that Benoite was not deceiving anyone, nor was she an impostor, or mentally ill. He also observed that Benoite had not asked her Lady to reveal Her identity, so to speak. At the magistrate's request, although personally it cost her a great deal, Benoite was obliged to ask: "My good Lady, I and all the people in this place are hard put to know who You are. Might You not be the Mother of our good God? Please be so kind as to tell me, and we will build a chapel here to honor You." The heavenly apparition replied that there was no need to build anything there because She had chosen a more pleasant spot. Then She added, "I am Mary, the Mother of Jesus. You will not see Me here any more, nor for some time." Benoite did not see her heavenly Mistress for an entire month. This cast her into such profound sorrow that without the assistance of Heaven, she would not have survived. On September 29, 1664, on the other side of the stream, halfway up the hill that led to Laus, she recognized the Blessed Virgin. "Oh, good Mother!" she exclaimed. "Why did You deprive me of the joy of seeing You for so long?" Then she crossed the swollen stream and threw her- self at the feet of the Queen of Heaven. The Blessed Virgin made this reply: "From now on, you will see Me only in the chapel that is in Laus." And Mary showed her the path that went up and over the hill toward Laus, a village the young girl had heard about but never visited, as she actually lived in the village of St.-Étienne d'Avançon. In 1640, some pious mountain people had built a little chapel dedicated to Notre-Dame de Bon Rencontre (Our Lady of Good Encounter) deep in the solitude of Laus. They had done so for the purpose of gathering there to pray when high water would prevent them from going to the parish church in Saint-Étienne. Exteriorly, the humble thatch-roofed structure looked like all the other small houses; just over two meters square, it had a plaster altar whose only ornaments were two wooden candlesticks and a pewter ciborium. That is where the Queen of Heaven awaited the young shepherd girl, as in a new stable of Bethlehem. since Benoite had never heard of the chapel, the next day she searched a long time for it in tears, going here and there, sometimes wandering away for a moment. She stopped at the entrance of each poor dwelling, trying to detect the "sweet fragrance." Finally she detected it near a door left ajar. Entering, she found her beautiful Lady standing on a dust-covered altar. "My daughter, you have searched diligently for Me, and you should not have wept. Even so, you pleased Me by not being impatient." Benoite humbly accepted this remark and then noticed with sadness the pitiful condition of the altar. "Honorable Lady, would You like me to spread my apron under Your feet? It is very white." "No, . . . soon nothing will be lacking here-----neither vestments nor altar linens nor candles. I want a large church built on this spot, along with a building for a few resident priests. The church will be built in honor of my dear Son and Myself. Here many sinners will be converted. I will appear to you often here." "Build a church?" exclaimed Benoite. "There's no money for that here!" "Do not worry. When the time comes to build, you will find all you need, and it will not be long. The pennies of the poor will provide for everything. Nothing will be lacking." Throughout the winter of 1664-65, in spite of the four kilometers that separated the village of Saint-Étienne from the Laus chapel, Benoite went up to it every day. And there she often saw the Virgin. Our Lady told her, "Pray continually for sinners." Oftentimes, She would name those She wanted her to pray for. In this way the Virgin was forming Benoite for her mission, which was to help priests in the ministry of Confession and the conversion of sinners. As of 1665, the Blessed Virgin asked her to stop tending flocks in order to devote herself to her mission. The Virgin had told Benoite, "I asked My Son for Laus for the conversion of sinners, and He has granted it to Me." The words of the Mother of God were fulfilled. As news of the continuing Apparitions spread, the number of visitors to Laus continually increased. Graces and blessings poured down upon souls; people came by the hundreds and then thousands to pray in the poor chapel. Cures of all kinds abounded and sinners were converted in great numbers. On March 25, 1665, less than a year after the first apparition, an immense crowd came to the once-deserted chapel. That same year, on May 3, Feast of the Holy Cross, thirty-five parishes converged there, each walking behind its particular banner. Altars and confessionals had to be set up outdoors to satisfy the piety of the people. Priests from the area came to lend a hand to Father Fraisse, the pastor of Saint-Étienne, and hear the many Confessions. Prudently, the diocesan authorities did not pronounce a decision, but they did permit Mass to be celebrated in the chapel. That is when the Reverend Canon Pierre Gaillard, the Vicar General of the Diocese of Gap, entered the scene. He was soon to become the director of the pilgrimage, and later he composed several authoritative narratives. 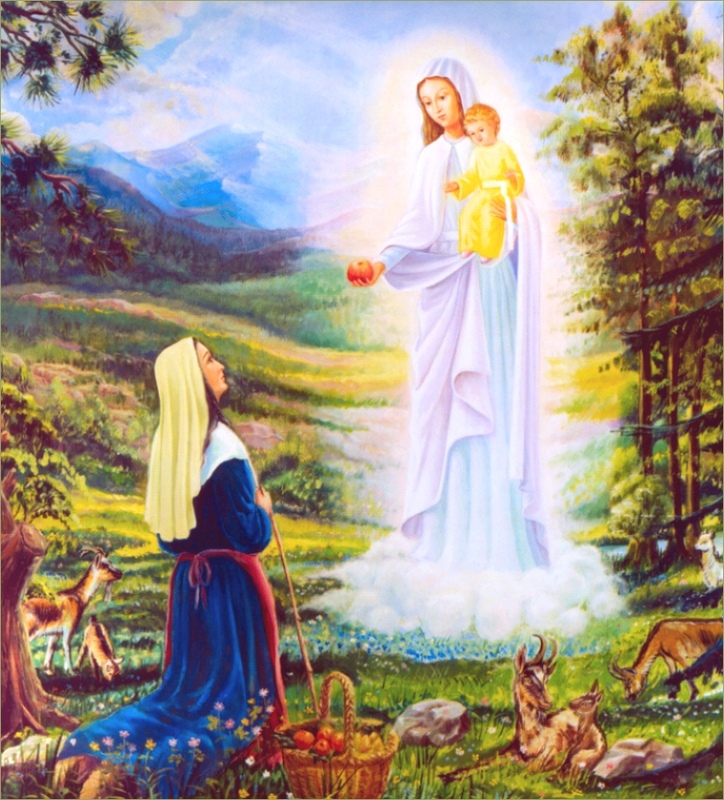 Having come out of curiosity in August 1665, he asked for and obtained such great graces there, that he was immediately convinced of the authenticity of the apparitions. However, Laus belonged to the Diocese of Embrun at that time. Being from the Diocese of Gap, Father Gaillard did not possess the authority to pass official judgment. Upon the recommendation of several priests, he therefore wrote to Father Antoine Lambert, the Vicar General of the Diocese of Embrun, and requested that he initiate an ecclesiastical inquiry. Father Lambert was most unsympathetic towards the apparitions at Laus, and he was not pleased to see the faithful forsaking the old pilgrimage to Our Lady of Embrun. He was convinced that Benoite's apparitions were diabolical and that she was just a common illuminate. On September 14, 1665, he came to Laus in the company of several eminent priests, equally unsympathetic to the events at Laus, hoping to put an end to "this sorcery," prove Benoite guilty of a hoax, and shut down the chapel. When the poor shepherd girl heard that they had arrived, she was so afraid that she wanted to leave, but the Mother of God reassured her: "No, My daughter, you must not run away. You must remain, for you must do justice to churchmen. They will question you one by one and try to catch you with your own words. But don't be afraid. Tell the Vicar General that he can very well make God come down from Heaven by the power he received when he became a priest, but he has no commands to give the Mother of God." When the Vicar General reached Laus, he entered the chapel to pray for a moment and then summoned the shepherd girl. Backed by his colleagues, he questioned Benoite haughtily, trying to trap her and make her contradict herself. She remained unruffled and answered him with simplicity and calm assurance. Her words were clear and surprisingly affirmative. "Don't think I have come here to authorize your visions and illusions, and all the strange things that are being said about you and this place," the Vicar General said severely. "It is my conviction, as it is of everyone with any common sense, that your visions are false. Consequently, I am going to close down this chapel and prohibit the devotion. As for you, you have only to go back home." Following the Blessed Virgin's inspiration, the shepherd girl answered him: "Sire, although you command God each morning and make Him come down to the altar by the power you received when you became a priest, you have no commands to give His holy Mother, who does as She pleases here." Impressed by these words, the Vicar General replied: "Well, if what people are saying is true, then pray to Her to show me the truth by a sign or a miracle, and I will do all that I can to accomplish Her will. But once again, be careful that these not be illusions and effects of your imagination to delude the people, or I will punish you severely to undeceive those who believe you. I will stamp out abuses with every means in my power." Benoite thanked him humbly and promised to pray according to his intentions. Father Fraisse, the pastor of Saint-Étienne, Judge François Grimaud and Father Pierre Gaillard were also questioned. The Vicar General, instead of closing down the oratory, made a detailed inventory and wrote out a lengthy report of his pastoral visit. He had planned on leaving that evening, but heavy downpours obliged him to remain for two more days. The Blessed Virgin had arranged it thus, so that he would witness a striking miracle. A well known woman of the area by the name of Catherine Vial had been suffering for the past six years from the contraction of the nerves in her legs: they were both bent backwards and seemed bound to her body, and no effort could separate them. Her case had been declared incurable by two eminent surgeons. Having come to Laus with her mother to make a novena, she was a pity to behold, crouched all day long in the chapel. Around midnight on the last day of the novena, she suddenly felt her legs relax and begin to move. She was cured. The next morning she entered the chapel under her own power while the Vicar General was saying Mass. Her presence caused quite a stir as the people exclaimed, "Miracle! Miracle! Catherine Vial is cured!" Moved to tears, Father Lambert had a hard time finishing his Mass. Father Gaillard, who was serving, wrote, "I am a faithful witness of all that occurred." And the Vicar General declared, "There is something extraordinary occurring in that chapel. Yes, the hand of God is there!" Father Lambert questioned the woman who had been cured and wrote out an official report of the miracle. Then he had everyone enter the chapel to sing the Te Deum and the Litany of the Blessed Virgin, and he named two young priests as chaplains at Laus: Father Jean Peytieu, who would die of exhaustion at the age of forty-nine after twenty-four years of ministry totally dedicated to souls, and Father Pierre Gaillard, who exercised an exemplary ministry there for fifty years as director of the pilgrimage. Father Barthelemy Hermitte was named to serve as their assistant, which he did for twenty-eight years until his death. The Vicar General concluded by authorizing construction of the church as the Blessed Virgin had requested. The little Laus chapel, where more and more wonders were being wrought, could scarcely hold ten or twelve people. It became absolutely necessary to replace it with a bigger church. The construction and the financing of that church constitute part of "the wonders of Laus." Although there were no resources at all, construction was undertaken with great enthusiasm. It was above all the poor, the little people, who took up the challenge, made doubly difficult by often impassable access roads. The people of the area and the many pilgrims who went up to Laus would take one or more stones from A vance stream and carry them to the construction site; even the children brought some of their own. Everyone wanted to donate something, whether materials or money. It took a year to gather all the necessary materials. Thanks to Father Gaillard's tenacity, the construction was built according to the indications Our Lady had given Benoite. To the great credit of those in charge, the chapel of Notre-Dame de Bon Rencontre was incorporated into the structure and became the choir of the new church. On October 7, 1666, Feast of the Holy Rosary, Father Gaillard laid the first stone of the building, and the Dominican Fathers from Gap presided over a long procession of pilgrims. It was on that occasion that Benoite became a Dominican Tertiary. From then on she wore the tertiary veil and cape, and people began calling her "Sister Benoite." Father Gaillard directed the construction work. Benoite saw to everything and motivated the workers. She prepared their meals, prayed with them and spoke words of salvation to them on occasion, sometimes adding a useful word of advice to avoid accidents. As a result of this, throughout the entire duration of the construction, not a single blasphemy was heard and no accidents occurred. Within four years, the church was completed (1666-70). An early historian wrote, "The Church of Our Lady of Laus was built to the singing of psalms and hymns. The hands of the poor gathered its materials, donations dug its foundations, Providence raised its walls, and confidence in God The earliest historians of Laus are unanimous in reporting the sweet, heavenly fragrance of the place; they mention it as a public occurrence to which a great number of people attested. These fragrances were sometimes so intense that their odor spread from the chapel all over the valley. Judge François Grimaud attested, "During the Easter Season of 1666, I smelled a very sweet fragrance for around seven minutes; I had never smelled anything like it in my life, and it gave me such deep satisfaction that I was enraptured." It is related that from March 24th till the end of May 1690, the Laus church was so pervaded with this fragrance that all the pilgrims attested to it. In 1716, because he had smelled this "sweet fragrance," Honore Pela, a sculptor from Gap, donated a beautiful statue in Carrara marble, representing the Virgin and Child. This phenomenon of fragrances is still occasionally experienced by pilgrims today. To avoid any possibility of deception, flowers are not usually allowed at the shrine. Sister Benoite breathed in these fragrances from their source. The manuscripts of Laus report, "Every time the Blessed Virgin honored her with Her visit, people smelled a heavenly fragrance that pervaded the entire church. Sometimes the shepherd girl's clothing was deeply permeated with the heavenly scent for up to eight days; these supernatural fragrances were so sweet and delightful that they lifted up the soul and surpassed all other fragrances on earth." Whenever Benoite returned from being with her good Mother, her face would seem to be ablaze, like that of Moses coming down from Sinai; she would kneel, recite the Litany of the Blessed Virgin, and then for the rest of the day she would be unable to eat. The oil from the sanctuary lamp burning before the Blessed Sacrament, and the maternal presence of the Virgin Mary having appeared on the site, are to Laus what the waters of the spring are to Lourdes. Physical and moral cures were granted in great number by means of this oil applied with faith. A certain quantity is regularly taken from the lamp for the pilgrims' use, and its beneficial effect is still active today. Let us recall that Saint Brother Andre of St. Joseph's Oratory in Montreal also used oil from the sanctuary lamp to heal the sick. More than anywhere else, it was in this blessed shrine that the Virgin Mary appeared to Benoite at least once a month for fifty-four years, and this is where Mary made Her messenger Her instrument for the conversion of sinners. Faithful to her mission, Benoite never stopped praying, suffering and exhorting. For many people, there is nothing harder than going to Confession. Rather than admit their sins to priests in order to receive pardon, many souls stop practicing their religion and sink even more deeply into sin. Out of compassion for Her sinful children, the Virgin Mary gave Benoite the exceptional privilege of reading into souls. Later, Saint John Mary Vianney, and more recently Saint Padre Pio, received the same charism in favor of the conversion of sinners. Inspired by Heaven, Benoite urged sinners to set their conscience in order; she enlightened those who could not see and, if necessary, revealed forgotten or hidden sins. She could "see consciences the way we see in a mirror, all at once," she said. She revealed faults, grievous and lesser sins, hidden motives, hypocrisy, and errors often committed unconsciously. She required simplicity and purity of soul, humility and a firm will to improve. She would even take away from the Communion rail people who were not in the state of grace. Benoite often had to make painful observations and say things that were not easy to hear, but she was so kind and compassionate that people were generally very grateful to her. After speaking with her they were resolved to purify every aspect of their consciences in order to amend their lives. Her hardest task was to reprimand or warn certain souls at Our Lady's behest. When she would put of this duty, the Blessed Virgin would defer a visit. It was not that the sainty seer was defying Our Lady in pride, but that she was so humble and simple in that humility that she considered herself unworthy of the task. One day a priest asked her why she acted as she did. "The Mother of God commands me to do it in such a mild manner that I don't believe She absolutely wants it. And when I fail, my good Mother corrects me without getting angry. So because of the shame I feel on admonishing others, I often wait for a second command, and then I obey." If it were only a question of sinners! . . . ----but she also had to guide their, confessors. To priests, she revealed their indiscretion, their lack of prudence in their manner of questioning penitents, their neglectful behavior, their grudges. Concerning a religious brother who was always on the move, she said, "Let him stay where he is. That is where he will work out his salvation, but he must be faithful to grace." She would see priests at the altar shining with light or tarnished, according to the state of their conscience, and she would warn the latter. A young priest from Embrun said, "You cannot be in that chapel without trembling if your conscience is not clear." The Blessed Virgin, for Her part, did not condone any failings in Her messenger. She counseled her and corrected her: "Take heart, My daughter! Have patience . . . Do your duty cheerfully . . . Bear no hatred towards the enemies of Laus . . . Do not be troubled and sick over it if people do not profit from your advice . . . Do not be disturbed by temptations, visible or invisible spirits, or temporal affairs . . . Strive never to forsake the presence of God, for whoever has any faith will not dare to offend Him." The humble shepherd girl could not love Mary without having a deep love for Jesus, Her Divine Son. She had chosen Him as the only Bridegroom of her soul, and she hungered to suffer with Him for the conversion of sinners. There was a Cross overlooking Avançon at the entrance to the vale of Laus. Benoite descended to pray there every day, even when it snowed or rained. Kneeling down, she would gaze at our Saviour on His Cross, and her heart would melt with love and compassion at the thought of all He has done for the salvation of men. To reward her, it pleased our Saviour to appear to her in the reality of His sufferings. She saw Him crucified, bleeding and in agony, with the wounds in His hands, feet and side, and red gashes from the scourging covering His Body. Transported with sorrow, she said, "Oh, my Jesus, if You remain like this another instant, I will die!" The sight of His sufferings caused her such great distress that one day her Guardian Angel came to assure her, saying, "Do not be troubled, my Sister. Although our Divine Master has appeared to you in this condition, He is not suffering anything; it is solely to show you what He suffered out of love for the human race." But these words did not console her. The fact that her good and sweet Master had suffered in that manner and to such an extent was sufficient to maintain the compassion she felt. On Friday, July 7, 1673, the bleeding Christ said to her, "My daughter, I am showing Myself to you in this condition so that you may participate in the sorrows of My Passion." Every week from that day on, she suffered a mystical crucifixion between Thursday evening and Saturday morning. This weekly crucifixion lasted fifteen years, with a two-year interruption from 1677 to 1679, when Benoite served food to the workers who were building the priests' residence; in November 1679, the mystical crucifixion was renewed at the Cross of Avançon. The enemies of Laus, including some priests, regarded these occurrences as bouts of illness, phenomena related to epilepsy or hysteria. They called the pilgrimage chaplains "visionaries, idiots and fools for so easily believing a girl who has no common sense." As for Benoite, her exterior martyrdom caused her to suffer because it attracted the veneration of the people, thus offending her sensitive humility. One day Benoite said to her good Mother, "May my sufferings be even more cruel if such is God's good pleasure, but let them be less visible!" The Blessed Virgin appeared to her the following Saturday and said, "You will no longer have the Friday sufferings, but you will have many others." She certainly did have "many others." The devil's rage could be felt increasingly all around her. What is more, Christ always marks the authenticity of His works with the seal of His Cross. Canon Gaillard states that from 1664 to 1672, incredulity made only a few small waves. But during the next twenty years unspeakable contradictions arose, especially among the clergy, then infected with Jansenist venom. Father Lambert, Vicar General of the diocese of Embrun, had passed away. A few members of the metropolitan Chapter who were prejudiced against Laus took advantage of the authority they exercised in the interim to issue an interdict against the holy girl; they posted their document on the doors of the cathedral of Embrun, and threatened with excommunication any priest who celebrated Mass in the Laus chapel. They also posted a sign on the church door at Laus forbidding public devotions on the site. The Blessed Virgin commanded Benoite, "Remove that paper... and let Mass be said here as it was before." She was obeyed. The Apparitions at Laus and Benoite were to meet with much hostility over the next twenty years. The Bishop, now old and in a weakened state appointed two chaplains who were not in favor of Laus, and turned the faithful away and for fifteen years Benoite was kept under house arrest, permitted only Sunday Mass. The devil even raised up visionaries to ape Benoite's devotions, to the point of deceiving weak souls. People necessarily stopped coming to Laus for a time. It was also during this sad period that the holy priests [ Fr. Jean Peytieu and Fr. Barthelemy Hermitte] who had seconded Benoite passed away. Even so, nothing was to succeed in ruining the pilgrimage completely. Benoite's Angel comforted her by lifting a little of the veil that hid the future from her: "There will always be troubles at Laus until there are Religious established here. The messenger's fidelity triumphed over this long "eclipse of Laus." At long last, the Bishop of Embrun awoke from his apathy. In 1712, six years before Benoite's death, the direction of the Pilgrimage was entrusted to some good priests, called the Pères Gardistes, "a deeply religious group of sound doctrine, moved by an ardent desire for the apostolate." On March 18, 1700, Benoite's Guardian Angel had told her, "The Laus devotion is the work of God which neither man nor the devil can destroy. It will continue until the end of the world, flourishing more and more and bearing great fruit everywhere." On the one hand she was tormented by the demons in Hell for the sake of the conversion of sinners, but on the other, she lived in familiarity with the Angels. She was especially close to her Guardian Angel, to whom she condied all he pain and sorrows, consulting him at every moment. He responded to this absolute trust with all kinds of services which, because of Benoite's perfect simplicity, did not even surprise her. He taught her the virtues of plants and helped her to clean the little chapel. One time, she had forgotten her shawl, little more than a rag, which she had left hanging on a branch in the woods. As she was suffering bitterly from the cold that night, her Angel brought it back to her. On many occasions he opened the church door for her and said the Rosary with her. But he also knew when to correct her. One day he confiscated a beautiful Rosary that had been given to Benoite, but to which she was too strongly attached. And it was quite some time before he gave it back to her. To the end, in spite of continual sufferings, Benoite remained Mary's faithful pupil and auxiliary with sinners. When her good Mother stopped visiting her to purify her, and Satan cried out, "She has forsaken you . . . You will no longer have any recourse but in me!" Benoite replied, "Oh, I would rather die a thousand times forsaken by Mary, than forsake Her for a single moment!" But now a burning fever consumed her, and for her, the nights seemed to be ''as long as years." She became bedridden one month before her death. On Christmas Day of 1718, after asking forgiveness of those who were present, for the bad examples she might have given during her lifetime, she requested and received Holy Viaticum. Suddenly her good Mother reappeared before her eyes, leaving behind a fragrance that pervaded the very poor chamber. The Pères Gardistes prayed for her cure. "Two more years, Lord!" they implored. But on December 28th she insisted on receiving Extreme Unction, knowing full well that she would be joining the Holy Innocents on their feast day. She received the Last Sacraments at three in the afternoon. There was no death agony; she appeared very happy. "We are your children," Father Royere said to her. "Will you bless us before leaving us?" At first Benoite's humility inclined her to refuse, but then her simplicity won out. "It is up to our good Mother to bless you," she said. And at once she raised her hand from her bed, not wanting to refuse them this consolation, and she said to them, "I give it to you most willingly, good Fathers." She said a calm farewell to everyone. Around eight in the evening, after the prayers for the dying had been recited, she asked her goddaughter to recite the Litany of the Child Jesus. And so she passed away in joy. She was seventy-one years old when she died in the odor of sanctity, as stipulated by the inscription on her grave. Sister Benoite Rencurel was declared Venerable in 1871 and beatified in 1984. The church in Laus was raised to the rank of a minor basilica in 1893. Among the great figures who had a special devotion to Our Lady of Laus, let us mention Saint Eugene de Mazenod (1782-1861), founder of the Oblates of Mary Immaculate; Saint Peter Julian Eymard (1811-1868), founder of the Blessed Sacrament Fathers and Servants; Dom Jean Baptiste Chautard (1858-1935), Abbot of Sept-Fons; and there are certainly many others who remain unknown to us. At the request of the bishop of the diocese, Saint Eugene de Mazenod assumed responsibility for the Shrine from 1819 to 1840. During that period he transferred his novitiate and scholasticate to Laus, where it was attended by Father Bruno Guigues, who became the first Bishop of Ottawa, Canada. As for Saint Peter Julian Eymard, he was scarcely eleven years old when by repeated insistence he obtained permission to make a sixty kilometer pilgrimage on foot while begging for his bread. He spent nine days at the holy shrine in preparation for his First Communion. Later he wrote, "That is where I first came to know and love Mary." He had a great devotion for his "Good Mother of Laus" all his life. In times of crushing fatigue, he loved to retire to that shrine. Our Lady of Laus, Refuge of sinners, look down with kindness and compassion upon the physical and moral miseries of our age! Have mercy on thy children and deign to convert us all entirely to the love of thy Divine Son! Adapted from Magnificat Vol. XL, No. 5 and Vol. XXXVI, No. 5.